We all have a wild side. Rebecca helps wild women practice yoga in a meaningful way so they can live happier, more peaceful life. In 2010 Rebecca discovered she spent her time being polite instead of owning her unique feminine wisdom and energy. Yoga helped her transform her into a truth speaking machine. In the summer of 2013, Rebecca decided to become a teacher and receive her RYT-200 Certification in Cahuita, Costa Rica. Being around other strong, courageous, wild women inspired her on a deep level. Going to class you can expect to be treated with respect and care. You will sweat but you will also restore and “unplug” from your daily worries. 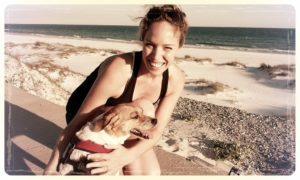 Rebecca has a Master’s Degree in Music Education and she loves to incorporate mantra and singing into her class flows.